Anyone can be depressed and I think all of us has experienced some form of depression during our lives. Yet depression is more than just feeling down. If the feeling remains long enough it can start affecting our everyday life. It can also have an impact on the ones closest to us too. Research tells us that approximately one in four people in the UK will suffer from a mental health issue at any one time throughout the year, with depression being one of the most common types. With the right support and treatment, such as counselling and hypnotherapy, it is possible to overcome this common mental health condition. Living with depression causes us to be hard on ourselves. We become self critical, pessimistic, restless and irritable. We constantly feel sad, anxious and empty. We can feel worthless and this can lead us to self harming or worse. Concentration becomes difficult as does decision making and motivation. Our sleep patterns are hit big time. We tend to sleep as much as we can yet we constantly feel tired. So our energy levels are low. We lose interest in our hobbies and activities and avoid contact with family or friends. We often feel a burden and that no one understands what we are going through. People telling us to "Snap out of it!" or "Pull yourself together" aren't helping. This only confirms to us that absolutely no one understands. It's important to know that many people really DO understand what it's like to have depression. Especially health professionals such as your Doctor. It can be extremely difficult to explain to anyone how we are really feeling. Yet this is an important first step to recovery. Once we've spoken to someone about how we really feel we can be assured that now we have someone on our side. Someone who will do their utmost best to help us. Depression is the result of our primitive brain overacting to our circumstances and experiences. For one reason or another it has registered that we don't feel confident, or we feel ill at ease. This could be because of an illness we are struggling to overcome, or a relationship issue that has gone wrong. It could be any number of things. The primitive brain protects us in times of trouble. It will assess the situation and react accordingly. If we feel sad, stressed, anxious or scared it will look at what we previously did in those situations and get us to follow that same pattern of behaviour again. It's worth noting here that the primitive brain is only interested in our survival. Not our happiness, just our survival. For example; When we have an emotional crisis, like falling out with our loved one. In the past we may have dealt with it by drinking more alcohol than what is usual. Every time we follow a previous pattern of behaviour we amplify it. So this time we drink more than we did before. Because of this we are unable to think as clearly and we make bad decisions. We will also sleep more but the quality of the sleep is affected. So when we wake up the next day we will feel lousy, and this only encourages us to hide away and avoid interaction with others. The primitive brain picks up that we survived the day and so is encouraged to repeat this pattern of behaviour again. Before long with are heading towards full blown depression. Hypnotherapy is gaining wider recognition as a suitable treatment for depression. I myself have successfully treated many people for depression and helped them get their lives back again. Psychotherapy and Hypnotherapy combined will work to find the root cause of the negative feelings and emotions and work together to remove the symptoms of depression. We will work together to develop better coping tools for you to use as and when needed. We will work on a plan to stop the depression cycle and start a recovery cycle instead. We will encourage positive thought, positive action and positive interaction. 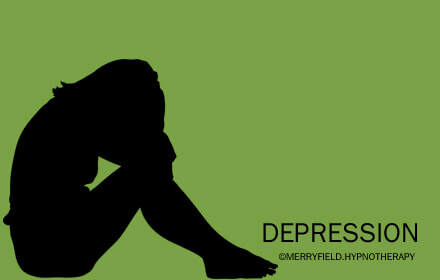 Using Hypnotherapy we will connect directly to the subconscious mind to start changing your perception of the event that caused the feeling of depression. Using this and other methods we will work together to establish the tools needed to help you see your preferred future. We will work on the plans required to help you achieve this wonderful goal. In time you will reach your desired targets. Your self esteem will be much improved and you will get your independence back again. ​These tools will be with you for the rest of your life.